When I mentioned to a couple of Westgarthians that I'd been to 'that new Turkish place' on High St, their responses seemed strangely understated. That may have been because my description of Najla was a little skewed by the wine I'd been drinking across the road at Bar Nancy (Crittenden Pinot Gris - lovely to see by the glass). 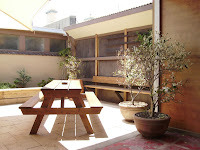 Najla has in fact been on High St for about four years, and before that had a ten-year stint on Brunswick St. Its cuisine has been described as Moroccan, Lebanese and East Mediterranean, and it's now most firmly rooted as Syrian, since a stint on SBS' Food Safari. In that excerpt, chef Najla Atmaja prepares Syrian national dish kibbeh, based on bulghur wheat and finely ground lamb mince, served in multitudinous ways. 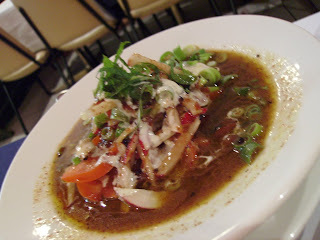 The Najla menu features several similar highlights from Atmaja's native cuisine. 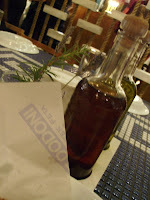 The menu breaks down into dips and bread, mezze, entrees and mains (most also available in an entree size). Some prices might look like a bit much individually, but I think there's enough choice there to order astutely. 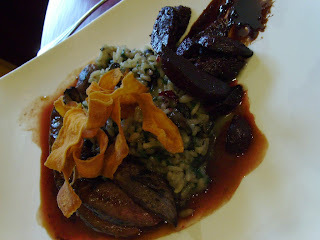 Remember, too, that this is a cuisine big on protein and carb - beans, rice, cous cous etc - so you'll fill up. Ful medames was a non-negotiable choice, a north-African dish eaten by riders at dawn to sustain them through a day in the desert. In our case we only required enough sustenance to carry us through another drink at the bar, so we were there for the flavours more than the fillingness! Traditionally, dried fava (broad) beans are cooked slowly and then set awash in a mix of lemon juice, olive oil and cumin. Broad beans are, of course, a particular favourite of mine, but ful is traditionally made with dried beans. The result is a nuttier flavour. Using the fresh variety would produce something more in line with a risi e bisi, since they wouldn't hold their shape during the long cooking time. At Najla, the ful also includes tomato, radish, spring onion and a yoghurt dressing. Pita bread soaks up the liquid and cups the beans, soft but still holding their shape. Restorative food indeed. A similar mix of beans and liquid - this time wonderfully pliant chickpeas in a lemon-yoghurt sauce - was the highlight dish of the evening. 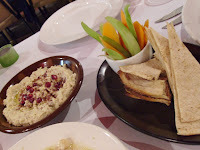 Less of a standout was the babaganoush - although rich and creamy it was altogether too smoky. I know that when cooked authentically it should retain that charred flavour - when making baba I cook each eggplant for 10 minutes over the open flame on a gas stove - but in this case the smokiness was too dominant. 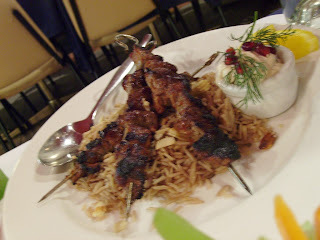 The only main we tried was lamb kebabs. Three skewers of sumptiously spiced meat atop a pilaf style rice with almonds, and a dipping sauce topped with pomegranate seeds. At around $25, this was perhaps a little pricey. It is available in an entree size, however, and one skewer less would be sufficient after you've worked your way through a dip or two, bread and some mezze. Pomegranate features strongly on the menu, either with its seeds scatted jewel-like over dishes, or with the wonderful sweet tang of pomegranate molasses enriching marinades and dips. 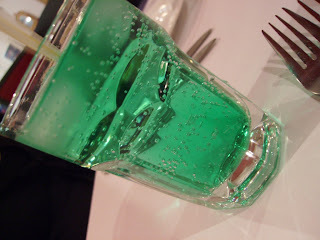 Almost as jewel-like in colour was the mint cordial with mineral water I chose as beverage: Very mentholly, but far less irradiating on the palate than it looks! Credit to the kitchen and floor staff on this occasion too, for taking in three hungry wanderers at 10pm and feeding them promptly and cheerily. Pubs are known for re-inventing themselves. 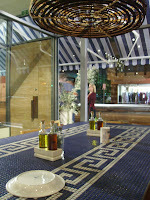 It seems the desire to drink in a particular locality is fairly constant, but our taste for the surroundings in which we drink needs to be regularly updated. As a rule, these re-inventions shift the pub away from the seedy end of the scale and towards the classy end. Sometimes a few clues as to the pub's lewder past are left behind, something for the refined, classier crowd to chuckle about as they congratulate themselves on picking out the diamond in the rough. Collingwood's Prince Patrick Hotel has retained its distressed concrete interior, but contrasted it against the plush banquettes and soft carpeting of the interior. A large, well-lit bar divides the 'pub' area - with big screen - from the 'dining' area - with tables, booths and cosy stool and table arrangements. The resulting atmosphere is more Sydney chic than Melbourne grunge. This is a pub that offers a $25 steak sandwich on their menu, and doesn't baulk at charging $7.50 for a pot of beer. Having said that, the bar staff are friendly, the food is well prepared and the portions generous. As always, however, I would vastly prefer to have $5-10 knocked off the price of a plate and receive half as much food, so that it's a serving size I could actually finish. 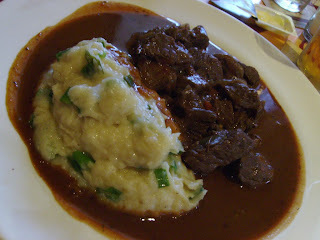 But cheap pub food isn't the look we're going for here. 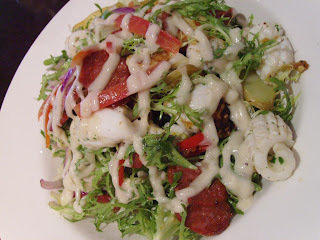 A calamari and chorizo salad promises a protein charge. It's enormous, littered with curled and scored pieces of calamari, no dearth of moist chorizo, and, just when you thought it was filling enough, thinly-sliced potato. I've no issue with the execution, but I prefer a salad to be under $20, and I don't feel good leaving that kind of decent produce behind after I've eaten more than my fill. 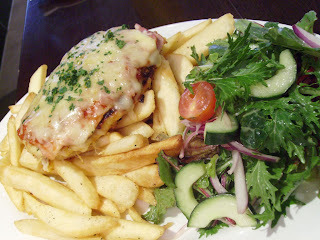 The chicken parma perhaps presents a better ratioed serving - certainly in the photo above it almost looks wee. In reality it was a good-sized serve, but at least one doesn't have to feel as bad leaving fried, sliced potato behind. Avoiding the oily decadence of the salad's chorizo, or the Union's pasta (see below), the parma is straightforward; better than de Biers' $5 version (don't go there), but not particularly imaginative. The Union Hotel in Brunswick West has taken a running leap up the class scale, leaving behind its repuation as one of the last gentlemen's pubs, replete with strippers, to be reborn as a bright, airy, diverse, family-friendly establishment with a long list of restaurant winners on the menu. They've done astonishingly well revamping the space: there's a small section of pubby bar in view of the television, demur tables around a small stage, an even more refined dining room at the back of the building, and outside a partially covered beer garden big enough for the non-smokers and smokers to still have their own space. The main menu starts down the path of list of pub staples - parmas, steak sandwich, pie and veg, pasta - then veers off into interesting territory: duck lasagne, anyone? The specials board is almost as long as the menu again, and shows similar adventurism, drawing on cuisines from the Mediterranean - zucchini fritters - to the Oriental - duck featuring again, this time wrapped in wontons. Their pasta is aptly handled. 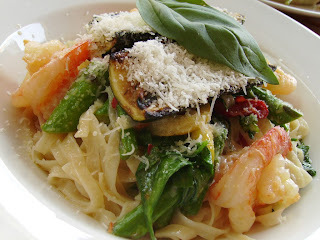 A pasta special with prawns, asparagus and eggplant would be at home in a well-heeled Italian restaurant - plump, juicy butterflied prawns perch jauntily between a generous serve of fettucine and chargrilled eggplant. 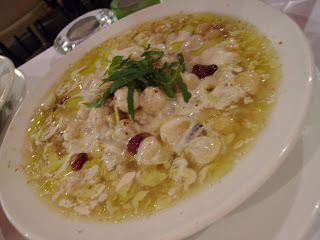 The dish was quite oily; richness perhaps being a trait common to their pasta dishes: at Where's the Beef they also review the pumpkin ravioli, along with several other worthwhile vegetarian dishes. 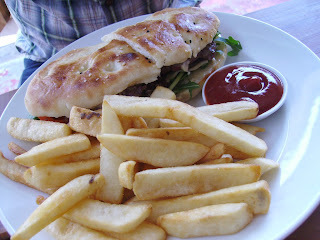 Their steak sandwich is suitably ample and flanked by thick-cut chips. Plenty of meat nestles between the toasted turkish bread, smeared with a quality aioli and decent Swiss cheese. The steak sarnie sits on the specials board rather than the main menu (and is about half the price of the Prince Patricks'), but the main menu does feature a beef burger, distinguished with pickle and tomato relish. The Union also has a commitment to local beers, with Mountain Goat on tap, and an imaginative wine list, also with plenty of local options. A J (Sandy) McKinnon presents us with a travel narrative more Thor Heyerdahl than Frances Mayes (as a man who can survive a whole day on one sandwich, it's hardly a food journal!) With a couple of interruptions, McKinnon rowed a Mirror dinghy (christened Jack de Crow) from Shropshire (near the Welsh border) to the Black Sea in Romania. He mostly traversed canals, but it was not all placid sailing, as the trip included encounters with enormous barges, unnavigable rapids, and a crossing of the distinctly unplacid English Channel. McKinnon, an Australian raised on P&O liners who was teaching in Britain before embarking on his nautical jaunt, is an erudite man. Each chapter is prefaced with a quote from literary masters such as Shakespeare and Wordsworth, and to while away the hours rowing French canals in summer he learns Keats' Eve of St Agnes by heart. He demonstrates his ability with words by coming up with so many ways to describe the surface of water in Europe's inland waterways. McKinnon writes in a Brysonesque style, but where Bill Bryson has clearly done reams of research (although he is adept at presenting his adventures as entirely spontaneous) McKinnon really did set out as a clueless adventurer. He is surprisingly unprepared for many aspects of his expedition- making a major navigational error when crossing the English Channel, not knowing how the locks on the French canals work - and yet, fortune seems to favour him throughout the journey. McKinnon has the happy fortune to repeatedly encounter local folk who insist on having him to dinner, or are happy to help build a new centreboard for his boat, and just happen to have the right tools to hand to do so. Perhaps we do all meet such folk when we travel, and if we sat down to write out how we got from our starting point to our destination we would find our story more littered with such acts of kindness than expected. I think it does befall a certain type of traveller more often than not, however, and it is as much about their eccentric circumstances as the inherent goodness of humanity. I've sat in hostel rooms with a dozen other people of similar age and aim, for example, where no conversation has sprung up beyond 'Is this bed taken?'. By doing something as random as sailing a dinghy from Shropshire to Romania, McKinnon has thrown himself in the path of interesting encounters (and a higher-than-usual proportion of people with interest in, and knowledge of, Mirror dinghies). It's a travel story worth the telling, though it does fall into some traps of the genre (the occasional arrogance of an English speaker, mixing up journal-style writing with narrative). Where so much travel writing is escapism, however, McKinnon's is an extraordinary story, an audacious feat for one at pains to present themselves as normal and unassuming.